In our series “She Eats,” we profile (literal) tastemakers — experts in the culinary space. They divulge not only their gastronomic philosophies and insight into their own meals, but their top skincare and beauty secrets. If you took the comic timing of Julia Louis Dreyfus, the cooking chops of Ina Garten, the curiosity of Anderson Cooper and the style of Sofia Coppola, you’d have the New Potato sisters. 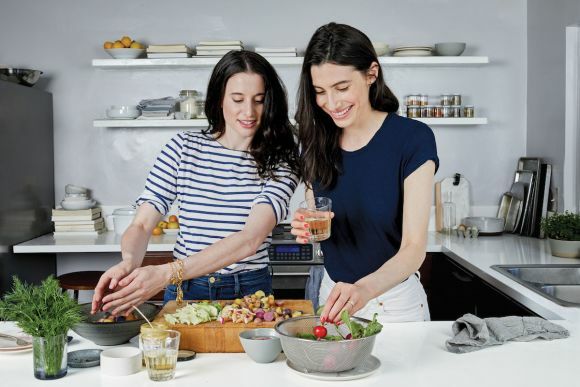 When Danielle and Lauren Kosann launched the New Potato, they turned food journalism on its side, asking questions about eating more than cooking, always with a strong emphasis on the experience, with a little style sprinkled in for good measure. Favorite restaurant? Fine, but they wanted to hear what their guests’ perfect food day would be. And don’t even get me started on how riotously funny their videos are (especially the one that Bobbi Brown and I are in!). Until they get their own TV show, they continue to entertain us on their website, as well as their new cookbook, Great Tastes, which shares some of their favorite antics with their favorite bold-faced subjects, interspersed among 85 original recipes. Oh, and they’re also beauty obsessed! So who better to introduce our She Eats section with? Here, influential women will be sharing their daily diets (because you know you’re curious). Keep reading! Spotlyte: How would you describe your overall diet intake? The Kosanns: Everything in moderation. We don't cut out anything. We love food, and don't restrict ourselves. We love to eat healthy and splurge when we want to! For us, that has always been the best way to approach our diets. Spotlyte: Any dietary struggles with food? The Kosanns: Luckily we don't have any dietary struggles, but we've come to know our bodies and what types of foods make us feel best, so we try and pay attention to that on a day to day basis. Spotlyte: How do you approach food and eating? Did you grow up in a gastronomic household? Or did you come upon your love of food once you hit adulthood? The Kosanns: We grew up in a household where food was a huge part of our lives. We loved traveling, going to restaurants, cooking at home, etc. A love of food was ingrained in us from the start! For us it's really about the experience of food and everything that surrounds it. Spotlyte: Possible to get a sample day of what you eat? The Kosanns: We're not big into routines when it comes to food, but generally speaking, we start with a really good breakfast — anything from whole grain toast with almond butter and jam, to great granola and Siggi's yogurt with fruit, or eggs and avocado if we're out at a breakfast. For lunch some sort of great salad or grain bowl with lots of veggies and grilled chicken or salmon. Dinner is our favorite meal of the day. We usually cook during the week and go out on weekends. A great pasta, some sort of Asian-inspired stir fry, or a roast chicken. We try to vary it up! And a glass of wine. Spotlyte: Do you believe what you eat affects how you look and feel? The Kosanns: Definitely. If you pay attention to your body you'll find that you can usually figure out what's making you feel good and what's making you feel crappy. Spotlyte: Favorite restaurant of late? Again, maybe one that matches your eating leanings? The Kosanns: Lately we've been loving Marc Forgione. The roast chicken for two is unbelievable. We always tend to gravitate towards classic and simple food, rather than very overly fancy fussy foods. We also love NYC spots like Minneta Tavern, Barbuto, and Locanda Verde. Spotlyte: We’d love a recipe from Great Tastes! The Kosanns: While we love a good caprese, this salad is a nice way to change it up a little. The salty Halloumi pairs perfectly with the tomato and herbs. Arrange the tomatoes on a serving platter or four plates. Lightly squeeze the lemon over them and season with flaky salt and pepper. Brush the grill grates with oil, then add the cheese and cook, turning once, until marks appear and the cheese is warmed throughout, about 1 minute per side. Place on top of the tomatoes. Drizzle the salad with olive oil and sprinkle with the basil and parsley. Serve immediately.